Our AWARD WINNING MS Degree is a post professional degree which provides opportunities for the student to examine current issues in depth. Issues such as integration of design research into professional practice, sustainability, health & wellness, senior living, aging in place, learning environments, interior design pedagogy, and material culture can be explored. Come “design your NEXT story” by pursuing an MS-ID degree. The Master of Science in Architecture with a Specialization in Interior Design is a research and scholarly based program. Students that enter this program are working towards careers in Interior Design research or academic settings. This 36-hour program is an online program. In exceptional cases students can pursue their degree on campus with a combination of distance and on-campus courses only with permission from the program director. New students will enroll with a Fall semester admittance only. The degree can be earned in a minimum of two years, but can be extended to fit individual goals. As part of the program curriculum, students are encouraged to gain hands on experience in the field through field work opportunities or an internship. Students engaged in the program have a wide variety of opportunities for specialization within interior design. If interested in designing for aging adults, the program offers a dual Interior Design and Gerontology Certificate as part of the required program courses. Additionally, courses can be selected within a student’s area of interest including healthcare, workplace, education environments, wellness, and environmentally conscious design. Prerequisite: An applicant must have an undergraduate degree in architecture, interior design or a closely-related field. Below are example pathways to earning an MS.ID degree in two or three years’ time. Our degree offers flexibility so times may vary depending on individual goals and circumstances. 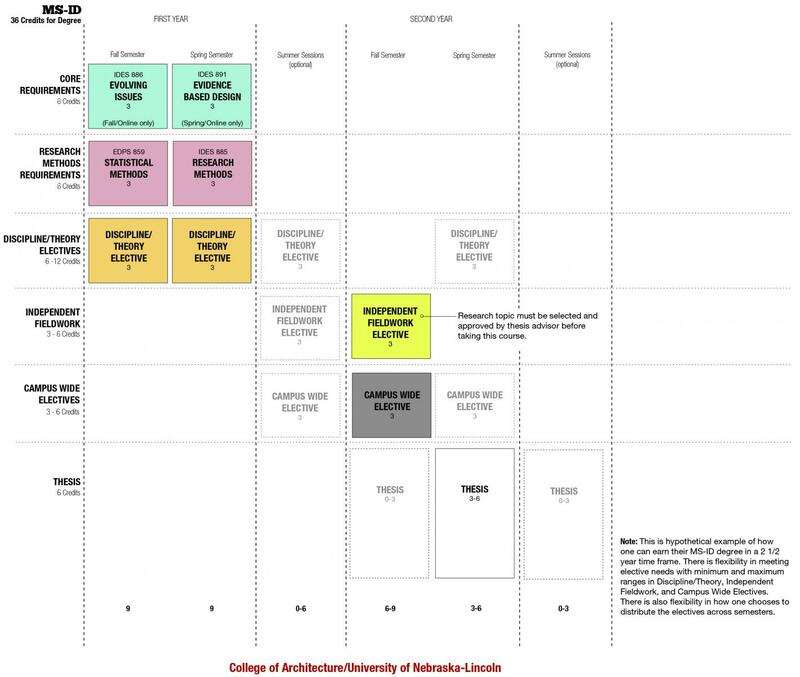 Students work closely with their advisor to determine courses within and outside of the College of Architecture to fulfill curriculum requirements while supporting indivdiual areas of interest and focus. • IDES 898 Problems in Interior Design. Courses are often taken close to when the student begins their thesis study so they are able to use the course to effectively work towards thesis work. The credits are meant to align with professional internship opportunities in relation to individual research and thesis goals and/or field work to prepare for upcoming research projects. Course expectations may include, but are not limited to: literature reviews, IRB certification, site inventory and analysis, and the development of research methods and data collection instruments. Learning outcomes and course deliverables will be developed with guidance and instruction of interior design faculty. 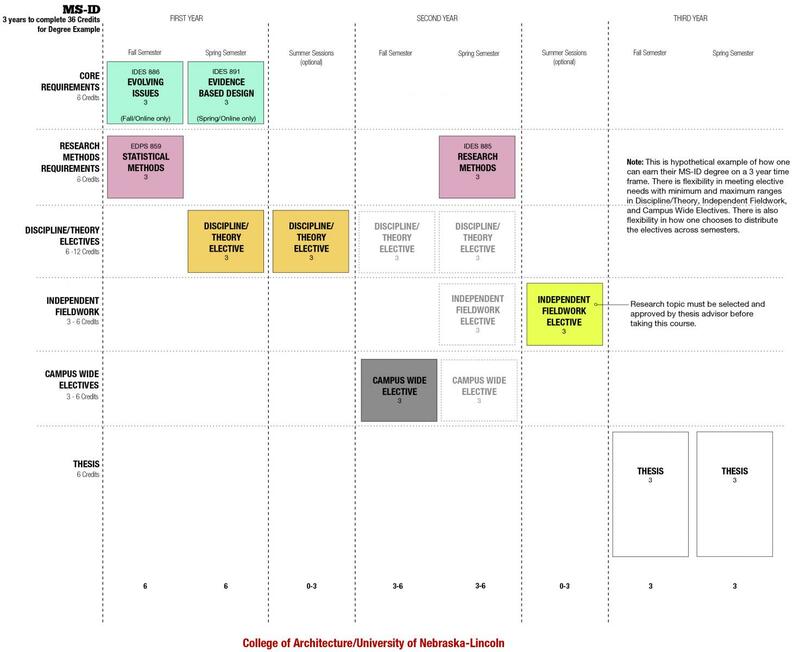 • In consultation with their interior design advisor, campus-wide electives can be chosen from graduate courses within the disciplines of psychology, sociology, anthropology, education, business and history. • The thesis will be used to gain new insights and to develop theory or to contribute to the body of knowledge that can in turn advance the discipline and practice of interior design. * These classes are only offered on campus.